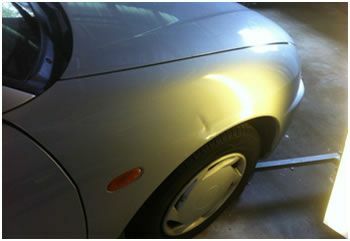 Sunshine Coast Car Paintless Dent Repairs, hail damage- Door dings. Paintless Dent Removal is a highly skilled craft and metal reshaping art utilising technologically designed hand tools to remove dings, dents, and hail damage without paint! Why you should choose Kiss Cars to serve you? WE COME TO YOU, at your home or office, no need to drop of cars and arrange alternative transport. Don't have time to leave the car at the panel shop for days on end; you can drive your car straight after we finish our work. Our services are economical; as we keep our overheads down to remain price competitive. 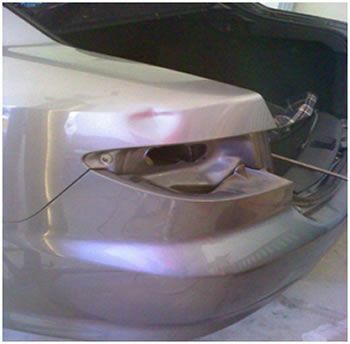 By only repairing the damaged area you save unnecessary costs of painting undamaged parts. Original paint is of higher quality than repairs so the less that is repaired the higher retained value. We minimise our impact on the environment by not using solvents , aerosols , body fillers or paint. For a FREE cost estimate please contact us email or phone. If you send photos with small dents please mark the position of the dents with a white board marker or sticky paper and take a picture of the entire damaged panel (close-up shots do not reveal the dents location on the damaged section). Photos are best taken early mornings or evenings to avoid glare/reflections. 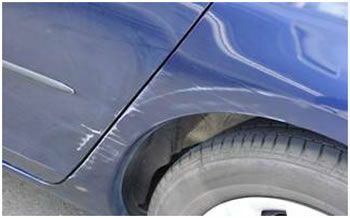 Paintless Dent Repair Of Hail Damage Carpark dents, trolley dents, bumps & bruises. Kiss Cars are going from strength to strength with more happy clients recommending our services every day. If you are passionate as us about service and cars, then we need to talk. Please call Michael now on 0427 566 009. Michael repairing a car for a car yard. 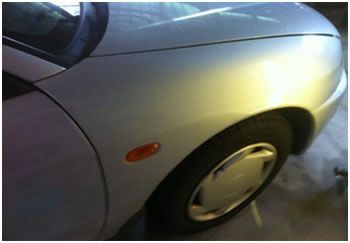 Have your car looking great using Kiss Car's innovative technology that restores cars damage to look “like new” again. The technology includes our new products and processes such as the durable Paint Protections CPP and CPP v2. Proven in Australia’s harsh tropical sun or freezing cold we repair paint chips, scratches, bird acid marks etc. in just minutes and at a fraction of the cost you would spend on spray painting. Unlike spraying the cars paint is kept in original condition. Kiss Cars repairs cars for discerning new car dealers, used car dealers, government departments and individuals alike. Dealers are literally saving thousands of dollars every week. Kiss Cars will finish your car to a superb quality finish. Also using the unique TOUGHSEAL products such as; Paint Protection Treatment ( with up to 5 years Warranty ), Alloy Wheel wax, Fabric/Vinyl & Leather protection and the newest silicone free polish that panel shops just love, Kiss Final Shine. Chips & Scratches repaired, Bird acid repairs, Car park damage, Steel, Yellowed Headlights repaired, Rusted or faded wipers arms renewed. Cut ‘n’ Polish. 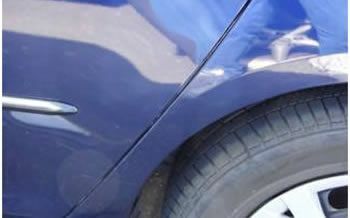 Removal of swirl marks in paint. Paint Protection Treatments, Fabric Protector, Vinyl / Leather treatment protector, Dry-Wash & guard, Wash & Gloss Shampoo. Colours are matched to the vehicle, so even faded or discoloured paint can be matched. 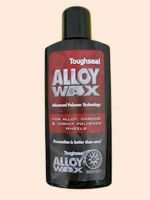 Rubbers / Plastics can be rejuvenated to a glossy lustre again dressing the car up. Competitive prices on car care products, such as Paint Protection, Fabric protection, Vinyl & leather protection treatments. No smoke, magic or mirrors just quality workmanship at economical prices that you will want to recommend to friends. 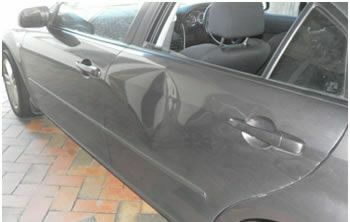 Even nasties like on this 2 Month old Mazda 3 can be repaired without costly resprays. This Blue Mazda repair at a panel shop, $ 800.00 or at least $300 excess and lose your no claim bonus. 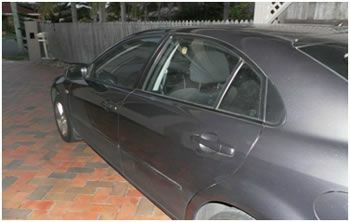 But Kiss Cars repaired this car for $90.00 The owner was over the moon. "It was cheap, quick and easy because Michael came to me. 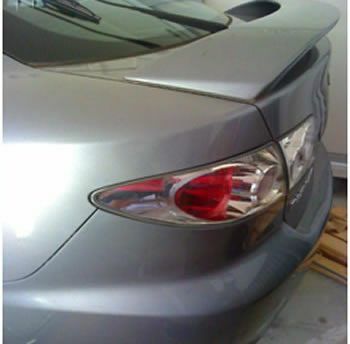 He did a fantastic job on my car, it looked like new again in no time!" 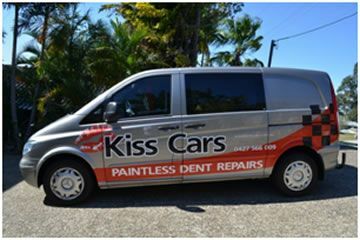 Kiss Cars repair cars each year for discerning new car dealers, used car dealers, government departments and individuals alike. Dealers are literally saving thousands of dollars every week. Also using the unique TOUGHSEAL products such as; Paint Protection Treatment ( with up to 5 years Warranty ), Alloy Wheel wax, Fabric/Vinyl & Leather protection and the newest silicone free polish that panel shops just love Kiss Final Shine. Paintless Dent Repairs, Chips & Scratches repaired, , Car park damage, , Yellowed Headlights repaired, Rusted or faded wipers arms renewed. Cut ‘n’ Polish. Removal of swirl marks in paint.